Like the previous meetings, Measuring Behavior 2012 will offer an attractive mix of oral papers, poster presentations, technical demonstrations, tutorials teaching how to use software and other tools and interactive workshops, user meetings organized by manufacturers, scientific tours to research facilities in Utrecht, an exhibition of instruments and software, and of course a very pleasant social program. The Conference Proceedings are also available for download. 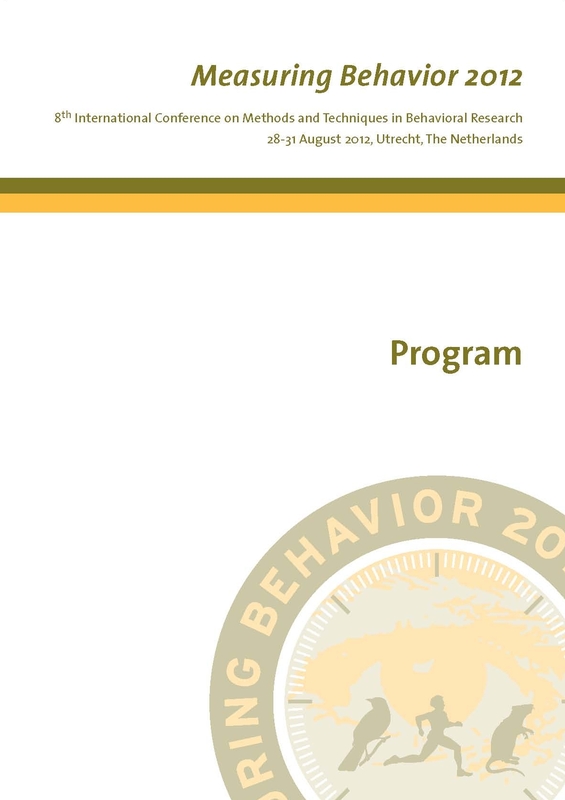 Special sessions - Measuring Behavior symposia consist to a series of scientific presentations around a common theme related to the general theme of measuring behavior. Paper sessions - Paper sessions will be divided in full paper sessions and poster presentations. Posters will be on display throughout the conference and in scheduled poster sessions. Demonstration showcase - Scientists who have developed a prototype of a measuring device or a beta version of new software that is relevant to the theme of the conference will be invited to demonstrate it at the the meeting. Tutorials - Tutorials provide a valuable opportunity to instruct participants of in specific methods, techniques and tools for behavioral research. Workshops - Workshops are interactive discussions about specific aspects of measuring techniques. User Meetings - These sessions include presentations about new developments, demonstrations of new products. Scientific Tours - Research facilities in Utrecht will offer guided tours to conference delegates. Social Program - The program will include various informal occasions where one meet colleagues while enjoying another side of Utrecht and its surroundings. Exhibition - International companies can participate in a commercial exhibition of instruments and software.